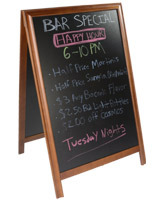 This Sidewalk Chalkboard Features A Stylish Red Mahogany Stain With A Satin Polyurethane Finish! Create Large Custom Messages With This Sandwich Board Sign! Purchase A Sidewalk Chalkboard From This Supplier Now! Wood frame with red mahogany stain & satin polyurethaned finish for elegance. 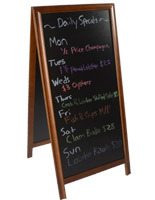 (2) 24" x 36" Blackboards allow multiple messages to be displayed at once. Use with wet or dry chalk markers. 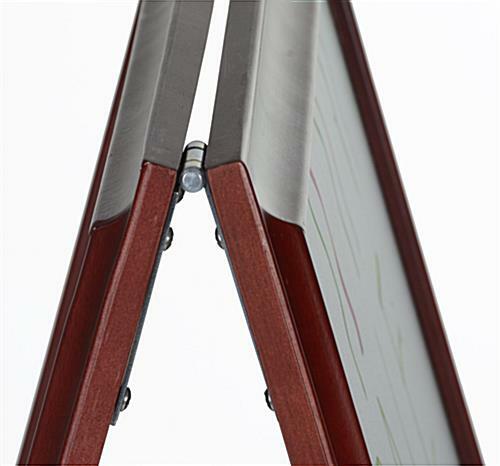 Top hinges allow unit to fold flat for easy storage and portability. Magic eraser is included to remove even the toughest of marks. 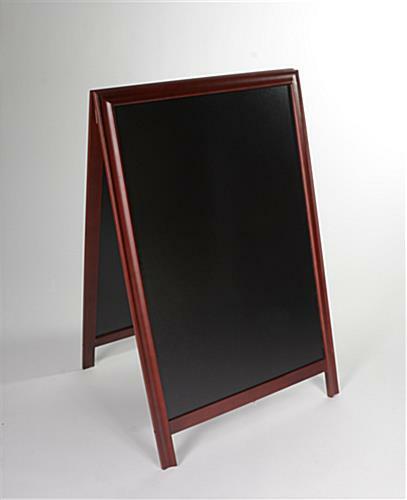 This sidewalk chalkboard, also known as a sandwich board frame, is constructed from quality wood with a red mahogany finish. 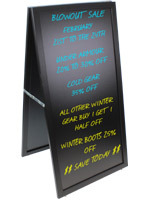 This a-frame display sign features (2) 24” x 36” writing areas to give users plenty of room for messages. This sidewalk chalkboard that has a red mahogany stain with a satin polyurethane finish will add elegance to any establishment. This easel display presents eye-catching advertisements. 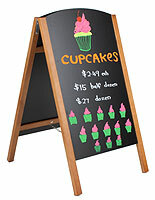 This write-on sidewalk chalkboard is ideal for store fronts and restaurants. 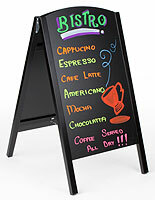 Use this sidewalk chalkboard to display special promotions, menu additions, ongoing events, and upcoming entertainment. This sidewalk chalkboard that is constructed from wood is built for durability. 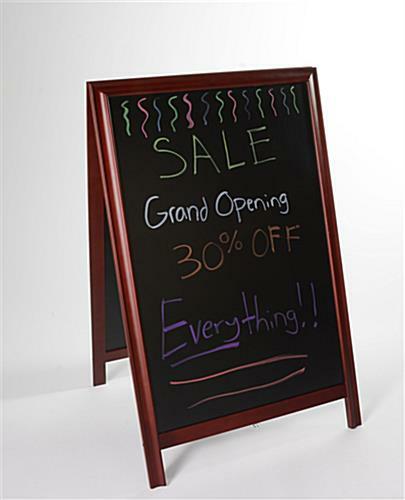 Use wet or dry erase markers to write on this sandwich board frame. Easily clean the sidewalk chalkboard with a damp cloth. This menu frame makes it possible to advertise multiple promotions at once. This double-sided sidewalk chalkboard is ideal for attracting the attention of potential customers approaching from multiple directions. 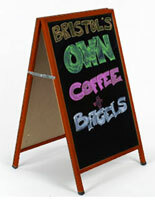 Use neon chalk markers on this a-frame sign’s (2) black panels to really stand out. This sidewalk chalkboard that is portable is easy to transport from to events. This sandwich board sign allows users to change messages as frequently as desired. This a-frame sign, sidewalk chalkboard also comes with a magic eraser. This magic eraser removes even the toughest of marks. 28.9" x 45.8" x 1.5"